Wonderful performances at the Secondary School Musical Evening! Yesterday evening, Wednesday 25th April, the Secondary School Musical Evening took place and what a night it was! Students must go through an audition process to participate in this event which means that the audience was treated to an extremely high standard of performance throughout the night. There was a wide range of soloists/duos in instruments such as piano, violin, cello, flute and harp, as well as many singers in both the musical theatre and classical genres. In terms of group performances, there were three choirs (First Year, Cecilian, Chamber), two traditional groups (Intermediate and Senior), and two orchestras (Intermediate and Senior). Special congratulations go to the students who went on stage up to three or four times throughout the evening, and also to the many Sixth Year students who still find time to dedicate themselves to their music even during such a hectic school year. Huge thanks to all the teachers who prepared their students. And thank you to everyone who attended – we hope you enjoyed this fantastic evening of entertainment! This Saturday, 30th September, the 2017 National Famine Commemoration will be taking place at the Famine Warhouse 1848 in Ballingarry, Co Tipperary. The event will include a wreath-laying ceremony, an address by An Taoiseach Leo Varadkar, and a variety of musical performances. The Ursuline Secondary School’s Cecilian Choir will be participating on the day and we congratulate them on this great honour. More information about the event can be found in this article on the Tipperary Star website. 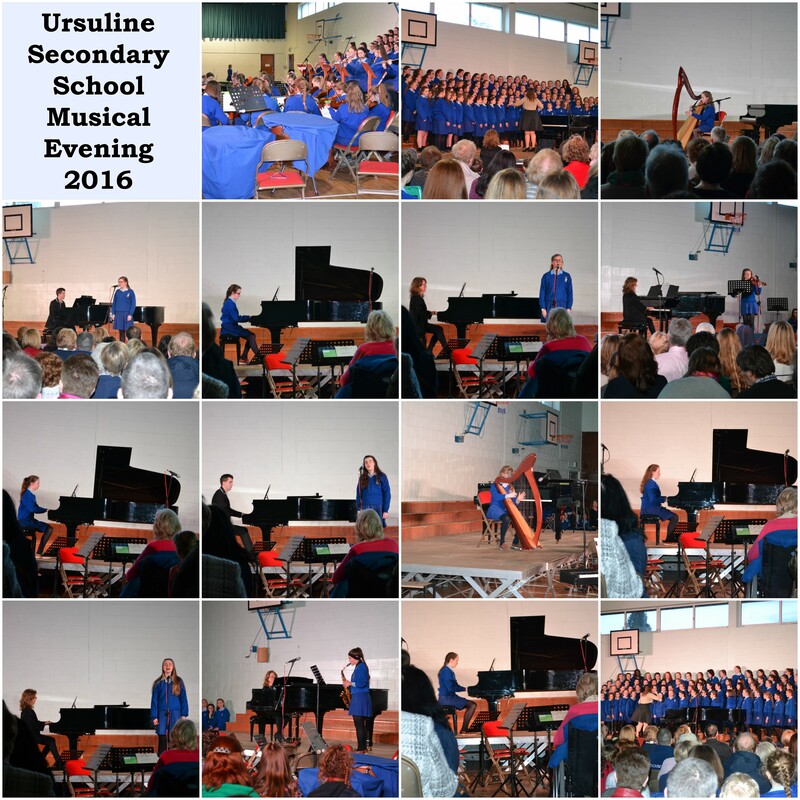 The Secondary School Musical Evening took place last Tuesday 21st March in the gym hall of the Ursuline Secondary School. It was a fantastic night’s entertainment, with performances from the Intermediate Orchestra, Senior Orchestra, First Year Choir, Second Year Choir, Cecilian Choir, Chamber Choir, Intermediate Traditional Group, Senior Traditional Group, and numerous soloists on a wide range of instruments, including piano, harp, violin, cello, flute, oboe and voice. This annual musical evening is an opportunity for the students to demonstrate how much they have achieved in the past school year, and their hard work was evident in the extremely high standard of performance last Tuesday night. An event like this cannot be successful without the support of the music teachers, in particular Mary-Rose McNally (who accompanied many of the soloists and conducted the orchestras), Joan Butler (who led all the choirs), and Kathleen Nesbitt (who played with the traditional groups). Sincere thanks also to the principal of the Ursuline, Mary Butler, who introduced each of the acts throughout the concert. Huge congratulations to everyone involved! We would like to extend our congratulations to the Ursuline Secondary School’s Cecilian Choir, who won in their category at the Limerick Choral Festival last Friday 3rd March. The Cecilian Choir is run by Mary-Rose McNally and Joan Butler. It has ninety members, including students from 1st Year up to 6th Year, and they take part in the choir voluntarily after school. Last Friday, they competed in the Equal Voices Post-Primary category in the Redemptorist Church in Limerick and came first in a field of extremely talented choirs. Congratulations to the students and teachers involved on their fantastic achievement! Finally, St Angela’s closes today for the midterm break and will reopen on Monday 27th February. We hope the break will be both enjoyable and productive! The Royal Irish Academy of Music held its annual Gala High Achievers Concert last Wednesday 7th December and we are delighted to say that the Ursuline Secondary School’s Chamber Choir was one of the performers on the day. In the academic year 2015-2016, over 40,000 musicians took part in the RIAM Local Centre examinations. 300 were deemed High Achievers and a selection of these performed in regional concerts around the 32 counties in October and November of this year. Only 10 were chosen to participate in last Wednesday’s Gala Concert at the Royal Irish Academy in Dublin, therefore it was a fantastic achievement on the part of the Chamber Choir to have been selected for performance. Very well done! We would also like to say congratulations to all students involved in the recent music examinations here at St Angela’s in November. The standard was very high, with many distinctions, and we hope you were pleased with your results. Finally, we extend warmest wishes to all students, parents and staff as we wind down for the Christmas break. The school will reopen on Monday 9th January 2017. We bid everyone a peaceful Christmas and all the very best for the New Year! The Royal Irish Academy of Music is hosting a series of concerts this November to showcase performances from the students who received High Achievers Awards in the academic year 2015-2016. St Angela’s Academy of Music will be represented at the Munster Concert and Awards Ceremony, which is taking place at 3pm this Sunday 13th November in the Lime Tree Theatre in Limerick. Naomi Ryan will perform in the category of Musical Theatre, while the Ursuline Secondary School’s Chamber Choir will also present two songs. We wish them luck in their performances and congratulate them again on their outstanding achievements! 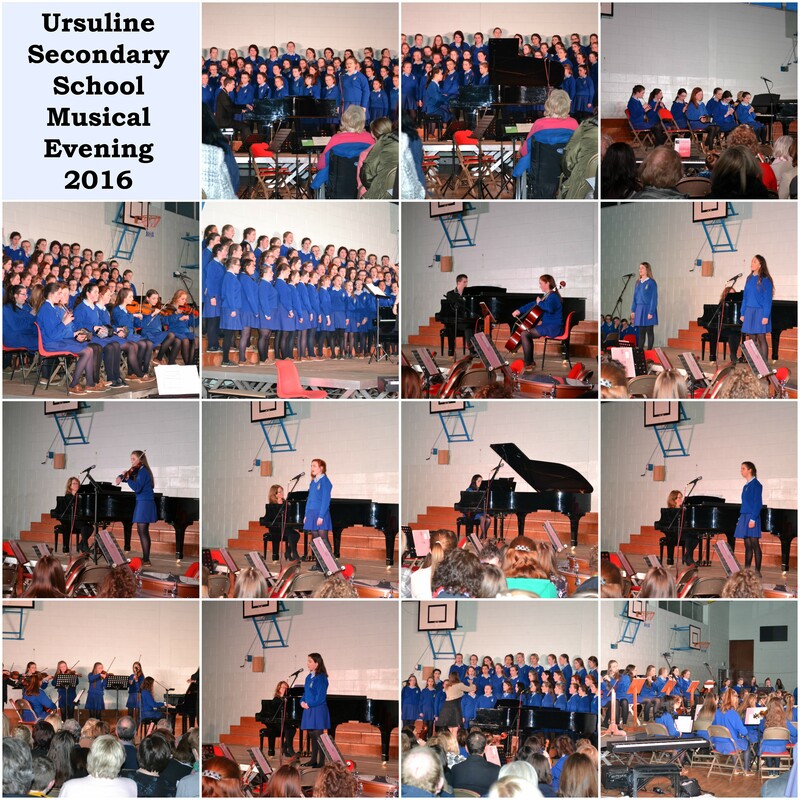 On Thursday 7th April, the Ursuline Secondary School held its annual musical evening, at which the secondary school students had the opportunity to show just how much they have achieved this year. The standard was extremely high and the audience was treated to a broad range of musical genres, including classical, traditional, musical theatre and music from the movies. There were solo performances in piano, voice, violin, cello, saxophone and harp, as well as a vocal duo and a piano-and-strings septet. On top of that, two orchestras, two traditional groups and four different choirs took to the stage. Below are pictures of the acts who performed on the night. Huge congratulations to all involved! Dates for your diary – two musical evenings coming up! First of all, a warm welcome back to students and staff after the Easter break. We hope everyone is well rested and prepared for the hectic final term of the school year! Please note two very important dates on the music school calendar. The Ursuline Secondary School musical evening is taking place this Thursday 7th April at 7:30pm in the Ursuline’s sports complex. All are welcome – entry is €5 per person or €10 per family. On the night, the audience will be treated to a wide variety of acts, including performances from the Chamber Choir, Cecilian Choir, Intermediate and Senior Orchestras, and Intermediate and Senior Traditional Groups, as well as soloists in a range of instruments, from piano and voice to violin, flute, harp and more. This is a night of guaranteed entertainment and not to be missed! St Angela’s will also be hosting a musical evening for primary school and external students on Wednesday 20th April. It starts at 7pm and will take place in the assembly hall of the Scoil Angela Primary School. For many of our younger learners, this is their first time to perform in front of an audience. In addition to the soloists, there will be group performances by the students from the Cara Awards and the Junior Traditional Group. These concerts are a culmination of the students’ hard work throughout the year. We do hope to see you there! St Angela’s Academy of Music would like to extend our warmest congratulations to the Ursuline Secondary School’s Chamber Choir, who won the top prize in their competition at the Feis Ceoil Music Festival in Dublin on Tuesday 8th March. The Chamber Choir competed for the Alice Oakley Quirk Cup which was open to post-primary mixed voice choirs under 19 years of age. Seven choirs participated in the category and performed in the RDS Concert Hall for adjudicator Catherine Ennis. The Ursuline’s Chamber Choir chose to present a contrasting repertoire of Ave Maria (Joshua Himes) and Incantations (Michael McGlynn) and were awarded first place following their excellent performance. Many congratulations to the students and teachers involved for this outstanding success! Want to hear our latest news? Just enter your email address to sign up and receive news updates from St Angela's by email.